Who is the fastest superhero on planet Earth? Superman, according to Guinness World Records. 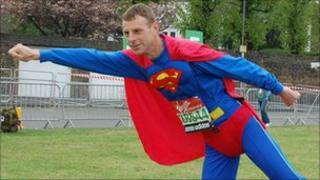 Superman, aka David Stone, broke the record for running the fastest marathon dressed in superhero costume at the London Marathon this weekend, running 26.2 miles in 2:42.46. When he is not undoing Lex Luthor's mischief as Superman, Mr Stone, 41, works not as a reporter for the Daily Planet, but as a garden centre manager, in Exmouth, in Devon. Dressed in a cape and figure-hugging blue suit, Superman swapped his red boots for a pair of trainers for this mission - and managed to shave 49 seconds off the previous record set by Batman's sidekick Robin in 2009. Before the race, Superman sat by the green start line surrounded by a familiar if rather surreal cast of characters. There was Wally, from Where's Wally?, a gingerbread man, the Super Mario Brothers and male and female carrots who had just met. They were all preparing for attempts to break various world records in costume. This year's London Marathon has seen more Guinness world record attempts than in any previous year. "Normally running in vests and shorts you get cheering, but as Superman it's going to be unbelievable," said Mr Stone before the race. The fastest marathon dressed as an animal or bird category looked set to be a close race. "I believe there's a panda out there I've got to go head to head with," said Martin Indge, 40, from Swindon, clasping the inflatable ostrich attached to his waist. "I'm worried that it won't stay on for the duration of the race," he added. "If I lose my outfit, I'll look a bit silly underneath." The ostrich pipped the Panda to the post, Mr Indge setting a Guinness World Record of 3:04. Costumed contenders needed to adhere to a strict set of rules to beat their records. But for the competitors, the money raised for their chosen charities was equally important. "I'm raising money for Cancer Research. They've taken good care of my mother and it's a good cause," said Mr Indge. Caveman bone raised in his right hand and sporting an orange leopard print number, Fred Flintstone was going for the record for quickest cartoon character. Fred, aka Jon Morgan, 43, from Sheffield, who usually works as an anaesthetist, said: "The costume looks pretty wacky, it should get me spotted and be good fun. "I'm hoping to find Betty and Barnie around the course." Apparently he did not have much luck finding his sidekicks, but Mr Morgan crossed the finish line in 2:46.59 - setting a new world record. But not all of the record attempts were costume based. Setting himself a mental as well as physical challenge, 35-year-old German Uli Kilian set a new record for the most Rubik's Cubes solved on a marathon. He solved 100 of them doubling the previous record of 50. "Attempting to solve the puzzle makes the body move awkwardly because you cannot counterbalance the running movement with the arms," he said. John Farnworth, 25, from Preston, Lancashire, was sure to be one of the biggest crowd pleasers at this year's race. He was attempting to break the world record for the fastest marathon juggling a football. The time to beat was 7:18.55. Guinness World Records spokesman Damian Field said: "An unprecedented 35 new Guinness World Records were achieved at the 2011 Virgin London Marathon." But as the record breakers cross the line throughout the day, make note in the diary to spare a thought for Lloyd Scott sometime in mid-May. Dressed as Brian the snail of The Magic roundabout fame, he hopes to raise at least £200,000 for children's charity Action for Kids. But by crawling around the course, its expected he will manage about one mile per day - a snail's pace.